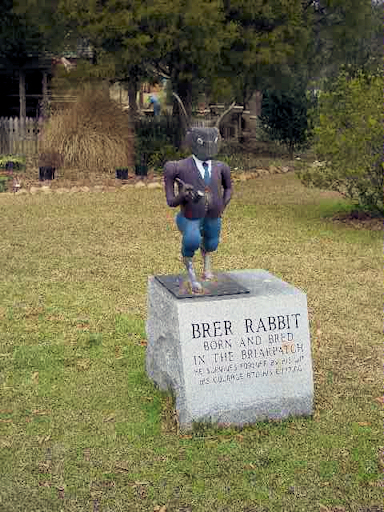 Dennis shares some photos of the Brer Rabbit statue and the Uncle Remus Museum in Eatonton, Georgia. The Uncle Remus Museum is a memorial to John Chandler Harris, whose work is remembered with fondness by some, and cynicism by others. 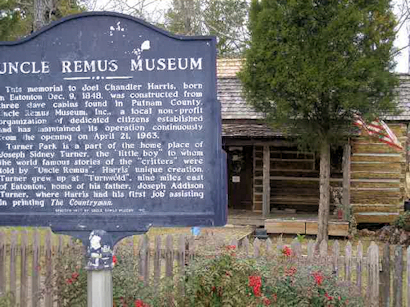 The museum’s website indicates that the Uncle Remus Cabin, which houses the museum, was made from materials taken from two original Putnam County slave cabins. If you are in the Atlanta area, you might want to visit The Wren’s Nest, the home that John Chandler Harris built — and where some of the Brer Rabbit stories were written. Dummies in the Attic is a great article from Paste magazine that examines the sometimes controversial connection between Brer Rabbit and the Disney movie Song of the South.